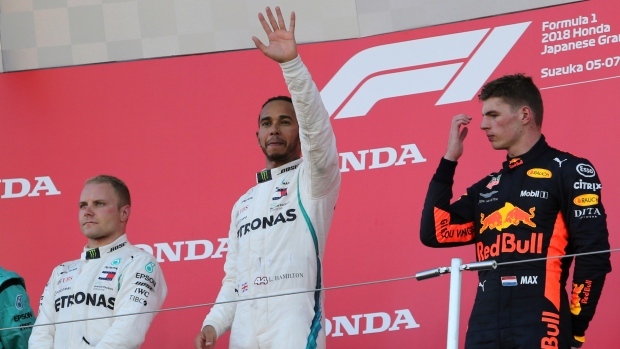 SUZUKA, Japan — Lewis Hamilton stormed to victory at the Japanese Grand Prix on Sunday, claiming his fourth straight Formula One win and moving a step closer to a fifth world championship. Starting from pole, the Mercedes driver was never seriously challenged and crossed the finish line 12.919 seconds ahead of teammate Valtteri Bottas. Red Bull's Max Verstappen was third, 14.295 seconds back. "The whole weekend has been incredibly strong for the team," Hamilton said. "It's a great 1-2 for Mercedes and shows you the strength and depth of our team." "We've gone from strength to strength as a team," Hamilton said. "And Austin is usually a good track for us so I can't wait to unleash this beast there." "I'm not the one who makes the rules," Verstappen said. "It was a similar situation to what happened in China with him. He could have been more careful." Vettel worked his way back up to sixth but couldn't move higher than that. It was an impressive day for Red Bull driver Daniel Ricciardo who started 15th but finished fourth ahead of Vettel's Ferrari teammate Kimi Raikkonen. Force India's Sergio Perez was seventh ahead of Haas driver Romain Grosjean. Force India's Esteban Ocan was ninth while Renault's Carlos Sainz rounded out the top 10. "Kimi chose the wrong line in the chicane, he could have also just waited for me to come back on the track," Verstappen said. "We touched a little bit but I really think it's ridiculous those five seconds."